Few things are as fascinating to a child as realizing that the amazing “character” and “story” she just read are true — that these things really happened, and that the person who did them was real. Not only is it a great way for kids to learn about historical figures, both famous and obscure, but it’s tremendously inspiring to know that they, too, could grow up to change the world. So what better way to celebrate Women’s History Month with your child than with some great picture book biographies? We’ve put together a list of great picture books about figures in women’s history, which we selected based on the high quality of their writing and illustrations. We’ve also included quite a few new releases: books that you may not have discovered yet, but are sure to become a cherished part of your picture book library. Of course, great biographies are available for readers of all ages! You can always go to our biography section and then use the menu on the left to sort by age to find the perfect biography for your Mighty Girl. Just Being Audrey, by Margaret Cardillo, illustrated by Julia Denos: She was a child in Nazi-occupied Europe, then a movie star and a fashion icon. But most importantly, she had a spirit of kindness and compassion that shone through everything she did. This biography of Audrey Hepburn explores how a little girl growing up through a war would become a beloved celebrity and humanitarian. For The Love of Music: The Remarkable Story of Maria Anna Mozart, written by Elizabeth Rusch, illustrated by Lou Fancher and Steve Johnson: We all know Maria’s brother Wolfgang Mozart, but his beloved sister “Nannerl” was a prodigy in her own right, forced to stop performing to become a proper married woman. But no one who loves music can give it up altogether. Beautiful collage and painting in the illustrations complement the author’s story. Heart on Fire: Susan B. Anthony Votes for President, written by Ann Malaspina and illustrated by Steve James: Kids will be captivated by this story of a woman who believed so strongly in the rights of women that she broke the law to vote in the US Presidential election. The story follows her arrest, trial, and infamous guilty verdict. The painted illustrations include bold color and strong, characterful faces. Check our our Susan B. Anthony collection for more products featuring this strong woman. Emily, written by Michael Bedard and illustrated by Barbara Cooney: A litte girl’s mother is invited to play the piano for her neighbor who hasn’t left her house for twenty years and runs away when strangers come to the door. But the little girl, who creeps up the neighbor’s stairs to investigate, discovers someone brilliant: poet Emily Dickinson. Bedard’s writing echoes Dickinson’s, and Cooney’s oils capture the shifting moods of the story. An authentic poem by Dickinson is included in the book. For more about Dickinson, see our Emily Dickinson collection. Amelia and Eleanor Go For A Ride by Pam Munoz Ryan, illustrated by Brian Selznik: On a spring night in 1933, two friends sneak out from a dinner party to find some excitement. Not an uncommon story -- unless the friends are Amelia Earhart, pioneering female pilot, and Eleanor Roosevelt, the First Lady of the USA, and their adventure is to commandeer a plane and fly from Washington, D.C. to Baltimore! Selznik’s pencil drawings capture the feel of a vintage movie as Ryan celebrates the adventurous spirits of these two great women. See our Amelia Earhart and Eleanor Roosevelt collections for more. Here Come the Girl Scouts! by Shana Corey and Illustrated by Hadley Hooper: In the prim and proper Victorian era, Juliette Gordon Low was seeking outdoor adventure and a chance to change the world. After seeing the Boy Scouts and Girl Guides on a trip to England, she knew what she wanted -- to found a group for girls dedicated to service and adventure. Girls will love reading about this passionate and dedicated woman, as well as the end note with portraits of former Girl Scouts like Gloria Steinem and Hillary Rodham Clinton. Seeds of Change by Jen Cullerton Johnson and illustrated by Sonia Lynn Sadler: Young Wangari Maathai was a big exception in Kenya: a girl permitted to go to school. After studying science in the US, she came home with a big plan — that started with Kenyan women and a handful of seeds. Kids will see their world in a new way after learning the importance of caring for the land they live on. You can find more books about Maathai in our Wangari Maathai collection. Sojourner Truth’s Step-Stomp Stride by Andrea Pinkney and illustrated by Brian Pinkney: Kids will be riveted by the story of a girl, born a slave, who escapes to freedom — only to realize that she can never feel free while others are suffering the same injustice. So she changes her name and walks, step-stomp, across America with a message of equal rights. Both Pinkney’s writing and excerpts of Truth’s speeches — including “Ain’t I a Woman?” — are perfect for reading aloud. Find more items featuring Truth in our Sojourner Truth collection. Who Says Women Can’t Be Doctors? : The Story of Elizabeth Blackwell by Tanya Lee Stone, illustrated by Marjorie Priceman: Elizabeth Blackwell didn’t want to be a wife, or a teacher, or a seamstress, but a doctor! When people told her she wasn’t smart enough, or strong enough, she knew better. And she had the best revenge: a brilliant career as the first female doctor. Vivid art captures the dynamism of this determined woman, who’s sure to inspire any girl who’s dreamed of a career in medicine. Look Up! : Henrietta Leavitt, Pioneering Woman Astronomer by Robert Burleigh, illustrated by Raul Colon: Henrietta Leavitt worked at the Harvard Observatory. She was only supposed to observe, record, and calculate; instead, she figured out how to measure the distance to a star! Burleigh tells a fascinating story about a little-known figure, and includes information about astronomy and the solar system, while Colon’s artwork renders stunningly beautiful midnight skies. This book is sure to have her looking up at the stars. Miss Moore Thought Otherwise: How Anne Carroll Moore Created Libraries for Children by Jan Pinborough and illustrated by Debbie Atwell: If your child loves the children’s room at her local library, she’ll love the story of the woman who created the very first library for children at a time when people thought reading wasn’t important for kids. Atwell’s artwork communicates the liveliness and excitement for change Miss Moore generated, which Pinborough celebrates in this lovely biography. 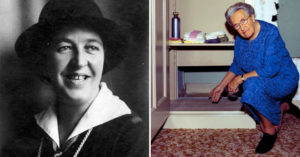 Marvelous Mattie: How Margaret E. Knight Became an Inventor written and illustrated by Emily Arnold McCully: She had a sketchbook titled My Inventions and her father’s toolbox — what more did she need? And when a man stole one of her inventions, saying a woman couldn’t understand mechanics well enough to invent something, she proved him wrong! This tale of “the Lady Edison” will inspire every girl who has imagined building something that will change the world. You Forgot Your Skirt, Amelia Bloomer! written by Shana Corey, illustrated by Chesley Mclaren: Your Mighty Girl will be amazed to hear that seeing a woman’s legs — in pants! — was once so controversial. Witty text and high-styled illustrations make the story of this early women’s rights activist a must-read. Me, Frida, by Amy Novesky and illustrated by David Diaz: When Frida Kahlo follows her painter husband to San Francisco, she feels lost. But sometimes, when you’re lost, you find things you didn’t know you were looking for. Follow Frida as she finds the inspiration to follow her own dream — which will make her one of the most celebrated artists in history. Novesky’s tale of universal emotions is highlighted by Diaz’s vibrant illustrations, perfect for helping your Mighty Girl believe in her dream. See more items featuring Kahlo in our Frida Kahlo collection. Amelia to Zora: Twenty-Six Women Who Changed the World by Cynthia Chin-Lee: This compilation for ages 7 to 12 introduces 26 women of the 20th century who have made a difference in their field. Some will be familiar, but there will be many new names on the list too! Every-Day Dress-Up by Selina Alko: Dress-up lovers aged 3 to 8 will love seeing this little girl imagine herself as famous women like Sonia Sotomayor, Julia Child, and Ella Fitzgerald — and wondering if little girls will dress up as HER someday. My Name is Not Isabella: Just How Big Can a Little Girl Dream? by Jennifer Fosberry, illustrated by Mike Litwin: Isabella has so many heroes — Sally Ride, Rosa Parks, Annie Oakley. But maybe pretending to be all of these great women will teach her something special about herself. Of Thee I Sing: A Letter to My Daughters by Barack Obama, illustrated by Loren Long: President Obama profiles 13 groundbreaking Americans in this book for ages 5 to 10, and tells the readers of this book that qualities that made these people great exist in every child. While not all of the people featured in this book are women, the profiles of Georgia O’Keeffe, Billie Holiday, Helen Keller, Maya Lin, and Jane Addams will provide plenty of inspiration! Of course, there are so many more great biographies out there. To discover over 400 biographies for readers of all ages, visit our biography section. We wish you and your Mighty Girl a wonderful month of learning about inspiring women! If you discover any books or other resources via this post that you would like to purchase, please use the "Buy at Amazon" link on every A Mighty Girl product page. By doing so, at no added cost to you, you help to support the site and allow us to continue providing you with wonderful girl-empowering resources. Thanks for your support!